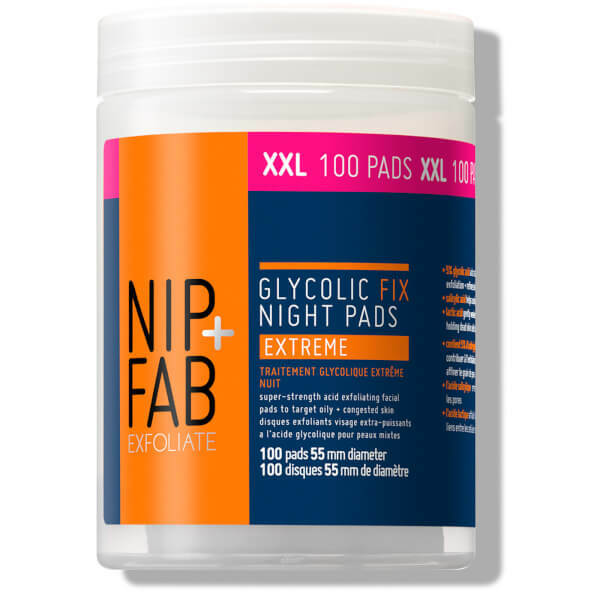 Clarify your complexion while you sleep with NIP + FAB Glycolic Fix Night Extreme Supersize Pads, an XXL version of the original cult product which works overnight to cleanse and energise the skin. The formula boasts a full recipe of nourishing ingredients, including 5% Glycolic Acid to exfoliate and balance the skin tone, Salicylic Acid to unclog pores and fight blemishes, Lactic Acid to remove dead skin and Hyaluronic Acid to hydrate and soften the complexion. The result is brighter, plumper, refreshed-looking skin when you wake up in the morning. 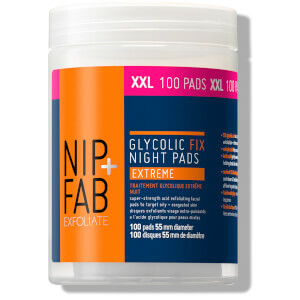 Wipe one pad across face, neck + décolleté after cleansing. Use two to three times a week at night. 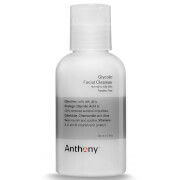 For sensitive skin use once a week. Apply SPF protection in the morning. Caution: Avoid delicate eye area. Should contact with eyes occur rinse well with water. Do not use on peeling or irritated skin. Do not use on children under 3 years old.